A postcard depicting the Canaveral Pier in Cocoa Beach, Florida. Now called the Cocoa Beach Pier, planning for the pier began in 1925, following the began election of Gus C. Edwards as mayor, although pier was not constructed until 1962. The Canaveral Pier offered a "grandstand seat" for spacecraft launches from Cape Canaveral, then called Cape Kennedy, during Project Mercury, Project Apollo, and the Space Shuttle program. 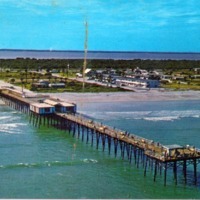 The pier was also the hub for surfing in Cocoa Beach, which was known as the Surfing Capital of the East Coast. In 1983, the Canaveral Pier underwent modeling and expansion, and its name was changed to the Cocoa Beach Pier the following year. This photographic postcard likely shows the pier in the 1960s. Originally published by Central Florida Distributors. "​Cocoa Beach Pier History." Westgate Resorts. https://www.westgatedestinations.com/florida/cocoa-beach/cocoa-beach-pier. “Canaveral Pier Postcard.” RICHES of Central Florida accessed April 21, 2019, https://richesmi.cah.ucf.edu/omeka/items/show/7554.